Homecare Oxygen Concentrators Market size is set to exceed USD 1.7 billion by 2024; according to a new research report by Global Market Insights. The homecare oxygen concentrators market will witness CAGR of over 10% during the forecast period owing to increasing geriatric population that is more to chronic respiratory diseases. In China alone, there were around 22.6 million people in the age group of 70-80 years and above. Elderly people have low immunity undergoing surgical procedures show high preference for home oxygen therapy augment demand for home oxygen concentrators. Increase in healthcare expenditures in developing countries such as China and India have propelled the industry growth in recent past. Rising disposable income will enhance the homecare expenditure capabilities of the population increasing the demand for homecare oxygen concentrators market. However, stringent government regulations on the home oxygen concentrators for maintaining the quality and efficiency of these concentrators will act as a barrier for some small manufacturing companies. The set regulations may increase the cost acting as an entry barrier for other manufacturing companies that will reduce the availability of oxygen concentrator devices thereby restraining the industry growth. U.S. held the largest market share of USD 297 million in 2017 owing to high disposable income. The population with high income have high affordability for home healthcare services. Moreover, growing geriatric population being susceptible to chronic respiratory disorders will increase the demand for portable oxygen concentrators. Aforementioned factors along with extended use of home oxygen concentrators while travelling will stimulate industry growth. 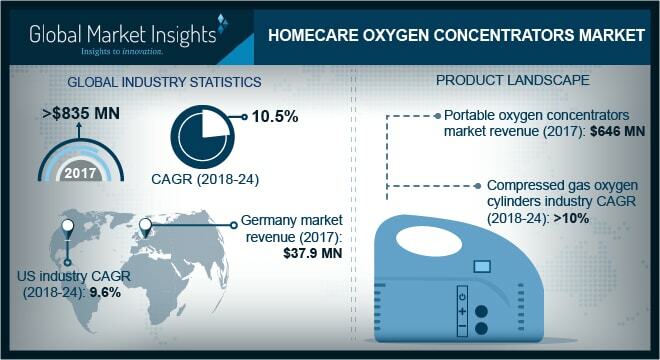 Germany homecare oxygen concentrator market will grow at a CAGR of 9.1% during the projection period, owing to high advanced technology adoption rates that will aid modifications in the home oxygen concentrators. Also, technological advancements have improved the battery life of home oxygen concentrators will increase its demand. Key industry players undertake certain strategic initiatives to maintain their market position. For instance, In June 2015, Precision Medical developed a new oxygen concentrator PM4130 EasyPulse POC3 that is integrated with advanced technology. New modifications have enabled release of appropriate amount if oxygen in the patient’s body. This initiative step has helped the company to generate revenue and sustain in market competition.